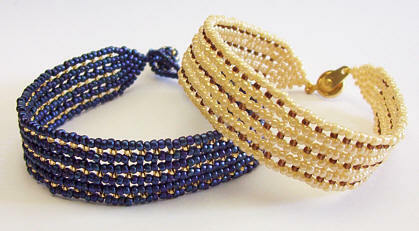 This bracelet is an easy to do variation on Herringbone weave. 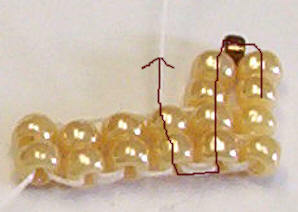 It starts with a ladder stitch, so if you don't know how to do that, I put up instructions here. NOTE: You can make your bracelet as wide as you'd like. Just make sure to start with an even numbered ladder. Pick up 2 MC, 1 SC, 2 MC, and go down through the next 2 bead column, then up through the next one. Make sure your SC bead is lying centered over the column. Repeat this stitch 2 more times to the end. When you get to the end, if you are doing the turn around without a bead (see ladder tute) go down through both beads in the ladder, then up through the next two, and over and up through the last column added. Now you're in position to do the next row. Now turn the piece over and start the next row. 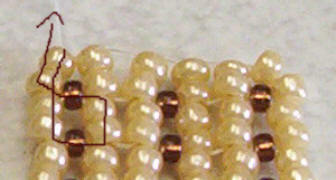 We'll be doing the same stitch now to the end of the bracelet. 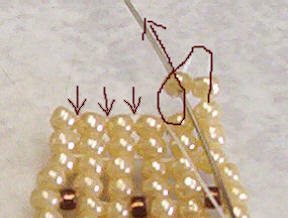 Pick up 2MC, 1 SC, 2MC and go down through 2 beads in the previous column, skipping the SC bead in the center. Then go up through the next column, (pulling snugly) and repeat to end. Repeat for the length of your bracelet. Be sure to leave about an inch for the clasp. If you want to make the ends come to a point, leave about 1.5 " So if you want your bracelet to be 7" when done, make this part until you have about 5.5". 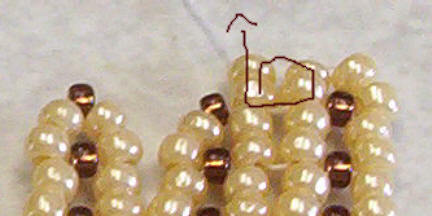 This measurement will vary of course, depending on the size of the clasp. I like to go and finish the first side of the bracelet before finishing the Herringbone part so that I can better judge how long to make it. 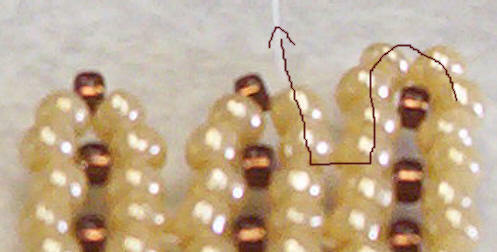 If you are doing the step-up without an accent bead on the side, you do it the same way, but now that you have the center accent bead, you need to go through that too as you're stepping up. Thread your tail onto a needle and pick up 2 beads. 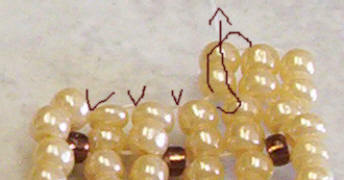 See the bridges of thread between the tops of the beads? That's where we're going to sew into. 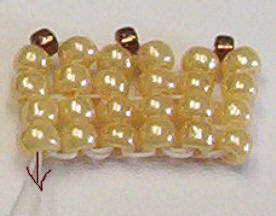 Go under the second thread bridge, then up through the second bead you picked up, and pull snug. 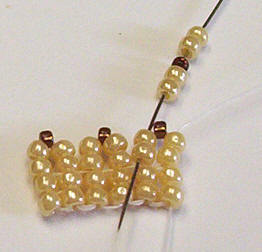 So pick up one bead, go under the next thread bridge, then back up through the bottom of the bead. Repeat until end of row. Do the next rows the same way. 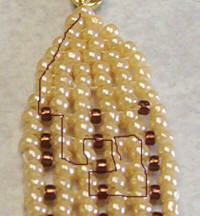 Do the first two beads together, then do one at a time to the end of the row. Turn and repeat. 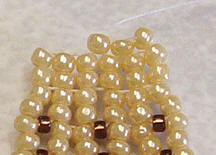 Each row will have one less bead than the row before, until you're down to only one bead on the end. Now you can add this half of your clasp. Now I'll show how to attach a ball clasp (also called a trailer hitch). This method will work for most clasps. I like to use gimp (also called French Wire) for a nice finish. The gimp is a tightly coiled fine wire, so it also protects your thread. You only need to sew through the clasp once when using this. 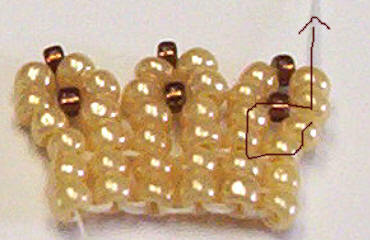 So cut 2 equal pieces about 3/8" (one for each end of the clasp) and string one piece on your thread. 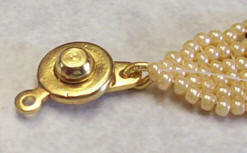 Go through your clasp, and back into the top bead of your bracelet. Ok, now that you have this side done, and can judge better how long to make it, lets get back to the other end and finish it off. When you get the herringbone part as long as you'd like it, it's time to make the ends come together. 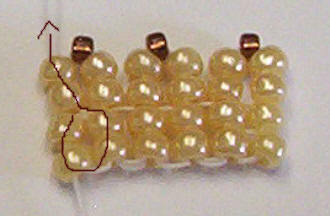 First pick up 4 beads, (without the small bead) and do a herringbone stitch as before. Now to get the rows together, and to get the thread bridge across to add your brick stitch points to, *Pick up just 2 beads this time and go back down through the previous column, then back up through the bottom of these two beads. 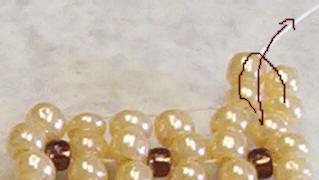 Pick up two more beads and go down through the next column as before, and up through the next. Repeat these two steps from the * to the end. Do your step up as before so the thread is coming out of the top of the last column. 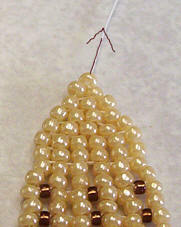 Now you will have a thread bridge between each bead along the top! We have to make this end match the other end, so for our first row of brick stitch, we're going to make it 2 beads high, and do an increase so that it's 6 beads wide. 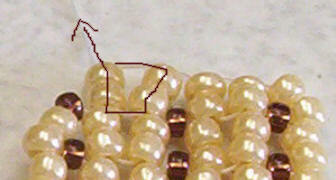 Pick up 4 beads and go under the 1st thread bridge, then back up through the last 2 beads. 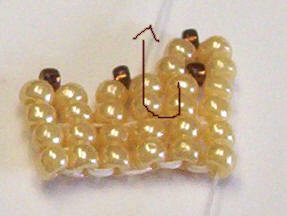 Then do brick stitch across like you did on the other end, except that you're making it 2 beads high instead of one. NOTE 1: Start with as long a piece of thread as you're comfortable with. I used about 3+ yards, but if you're not comfortable using that much, you can always add more as you go. Note 2: This tutorial and all others on this site print best from Internet Explorer. It may print only the first page if you're using another browser. I'll be using Ecru for my main color and silver lined bronze for my accent color in this tutorial.